Automatic Labs says its device will work with a smartphone to notify a mechanic if the check-engine light illuminates. Zubie Inc., Charleston, S.C. $99 cellular device with $99 annual fee after the first year Took in $8 million investment from Nokia's venture arm in July; Telefonica has licensed device for sale in Germany Business fleets make up 40% of Zubie's users. SAN FRANCISCO -- The do-it-yourself version of the connected car has arrived. Some startups, impatient with automakers' progress and promising to bring older vehicles into the data-driven age, are racing to market with hardware and apps that tap into the OBD-II diagnostic port built into all new U.S. light vehicles' dashboards beginning in 1996. These startups hope that by helping drivers watch their fuel use, driving habits and maintenance needs, their technologies will become the automotive version of the trendy Fitbit activity-tracking wristband or the Nest Learning Thermostat. And having signed deals with major auto industry players in recent months, the companies are coming to symbolize the maturation of the dashboard data industry. The devices offer plenty of features. Automatic Labs says its gadget will send an email to a mechanic when the check-engine light turns on, or call for an ambulance if a driver gets into a crash. Zubie has a partnership with insurance company Progressive so that Zubie users can get discounts for sharing data to prove that they drive safely. In a way, they are competing with mass-market automakers such as General Motors, Hyundai and Volkswagen, which now offer onboard cellular connections and separate smartphone apps so users can harness their vehicles' data for various purposes. The startups' goal is to speed the transition, bringing the connected car to people who can't or won't buy a new vehicle. 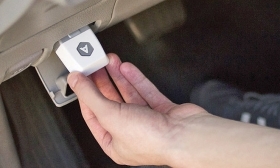 "This is a tidal shift for the connected car," said Jay Giraud, CEO of Mojio, which plans to launch its first product, a $149 cellular-equipped link to the OBD-II port, this fall. "Pardon my cynicism about the connected car, but where is it? People have been waiting for a decade for all these smart cars that are yet to appear, unless you're buying a BMW 7 series." Zubie, which sells a $99 cellular device that plugs into the OBD-II port, revealed in July that Nokia, a major automotive player through its HERE mapping service, had dipped into a $100 million connected-car fund to invest $8 million in the company. Then, last month, Zubie announced plans to launch its service in Germany through a deal with cellular giant Telefonica. The device will bear Telefonica's O2 brand and will be sold at hundreds of O2 retail stores. "They have tens of millions of customers in Germany," Zubie CEO Tim Kelly said in an interview. "The ability to sell into that large subscriber base with an additional connected device was very attractive." Also in September, Automatic Labs and Ford Motor Co. jointly launched an app to make Automatic's $99 device compatible with Ford's Sync infotainment system. The combination allows drivers to use Apple Inc.'s Siri voice-activated assistant in cars that did not ship with Siri onboard. For competitive reasons, the start-ups decline to say how many users they have. But the numbers appear to be fairly small compared with the most popular apps for Apple's iPhone and Google's Android operating system. The apps used to access Automatic and Zubie have been downloaded from the Android store between 10,000 and 50,000 times. New York-based Dash Labs, which doesn't sell an OBD-II device, offers a free app that has been downloaded more than 50,000 times. It works with third-party devices that cost less than $10 on the Internet and focuses on social uses of car data: allowing drivers to compete for the best efficiency score, for instance. The big challenge now is moving past the early adopters. Ljuba Miljkovic, chief products officer at Automatic Labs, said his company's situation today is similar to that of Fitbit several years ago. "They're promising that you can live better," Miljkovic said. "I think that's similar to where we are right now. We're trying to improve every aspect of the driving experience." The startups must also tread lightly with automakers, which have traditionally been reluctant to surrender control of their offerings to outside technology companies. Kelly said that Zubie has learned from the growth of the mobile phone market that it can succeed by delivering a common experience across many brands of cars. He noted that in the 1990s and early 2000s, telecom companies such as Verizon and AT&T tried to set up services for messaging, videos and music. They relented once customers migrated to common platforms from Apple and Google. "That will happen here," Kelly said. Referring to Apple's CarPlay infotainment interface, he added: "It's already starting to happen."